For young people progressing in employment is becoming increasingly reliant on showing skills and experience beyond the classroom. Participation in schemes like the Duke of Edinburgh Award carries increasing weight and should therefore be accessible to everyone. 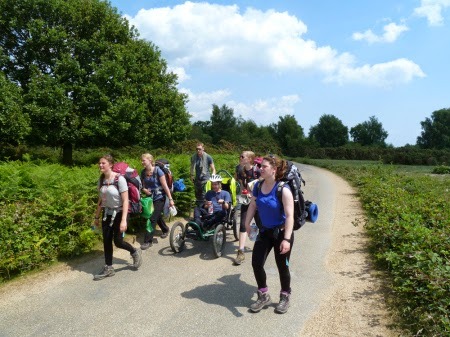 Over the last five years we have helped four young people with mobility impairments achieve success with Duke of Edinburgh award expeditions; from hiking through the New Forest to journeys along the South Downs. In this blog post we look at the points to consider when using a Boma chair as part of a Duke of Edinburgh expedition and where you can find advice to help you plan a trip yourself. 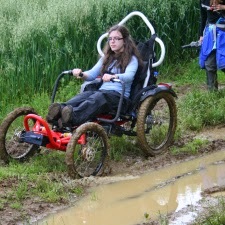 For wheelchair users travelling in tough off-road conditions there are limited options; if you have good strength and ability, then you could push yourself or maybe use a hand cycle. If you don’t have good strength, then you can either be dragged along or drive yourself using a Boma. A Boma is extremely empowering, allowing the rider to be independent of the team, even in tough conditions and to carry their own kit/rucksack. 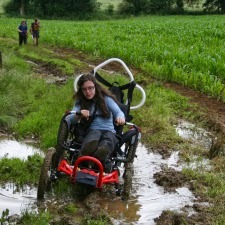 Even for those with minimal strength and ability, the act of driving the chair and manoeuvring over rough ground means they are fully participating in the journey. A Boma can deliver an outdoor experience unlike anything else. The rugged Boma chair is lightweight (approximately half weight of a standard powerchair), with batteries that can be quickly swapped for extra range. It is available with both handlebar and joystick control options to cater for all abilities, and can be easily transported between sites. How will the Boma fit into the expedition? If you would like to use a Boma as part of an expedition there are an increasing number of organisations who may be able to lend or rent a chair. Organisations will cover a particular area; Colchester, Buckinghamshire, Essex, Derbyshire, Perth & Kinross, New Forest and Brecon Beacons. Top tip: We would recommend that the Boma be considered as part of the expedition from the very beginning. The earlier that points such as route planning, battery charging, secure storage and transport are considered, the easier it is to deal with each one. Step One would be to arrange to try a Boma chair to ensure it is safe and comfortable for you to operate. If a member of the expedition team can also be present at this initial test, all the better. Bringing the team supervisor into the process at the beginning helps to any alleviate concerns they might have of working with the equipment and also enables a more informed planning process. what distances will be covered and over what terrain? What are the obstacles (gates, ditches, rivers)? Will a spare set of batteries be required? If so, how will they be carried? Does the overnight campsite have a power supply? Can the Boma be stored securely overnight? None of these problems are difficult to overcome, but it is important that they are considered to get the most out of the expedition experience. Top tip: In the past organisers have said that having the Boma on the expedition really help to focus the teams planning and efforts; it could be said that doing an expedition with the Boma makes planning easier! Step Three would be to run a short “shakedown” trip to bring up any problems or points that have been overlookedduring the planning process. There is always something overlooked and is better to find out in a short trip with easy access to support as opposed to halfway across Dartmoor! Incidentally, you might be interested in our outdoor clothing blog looking at finding the right kit to keep you warm and dry when sitting (wheelchair users) while being easy to access (anyone with a mobility impairment). After this and maybe a little bit more planning, it’s off to the expedition and hopefully a successful qualification. We hope this information gets you thinking about how the Boma might fit in with the expedition/school trip you are involved with.